Exploring Denmark by cycle, on foot, and on water is easier following the release of detailed topographic mapping and interactive trail guides within the ViewRanger Outdoors GPS app for Apple and Android devices. Topographic maps from the Danish Geodata Agency (Geodatastyrelsen) and more than 200 free-to-download guided walking and cycling trails have been added to the app, which is popular with outdoor enthusiasts worldwide. The ViewRanger app is free to download and offers access to a global library of free mapping and trail guides. Danish topographic mapping at both 1:50,000 and 1:25,000 scales can be easily added via low-cost in-app purchase. Detailed topographic mapping for Sweden, Norway, Finland, Germany, and many other countries can also be added. More than 200 walking and cycling trail guides from across Denmark are immediately available to download, for free, including the Nationale Cykelruter (National Cycling Routes) and recreational trails from a collaboration between more than 50 municipalities and regions in Denmark, Sweden and Norway. Across Europe and North America, ViewRanger offers thousands of trail guides from guidebook publishers, tourism organizations, walking festivals, accommodation providers, and more. Trail guides include navigable waypoints for the route plus description of the trail, and often photos, weblinks, accommodation tips, and other useful information. 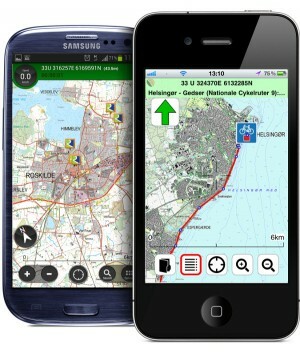 Maps from Danish Geodata Agency (Geodatastyrelsen) downloaded to the ViewRanger app can also be viewed through the app’s companion website “MyViewranger.com”. The website allows route plotting, recorded GPS track analysis and map printing from a larger desktop screen. Alongside its worldwide community of outdoor consumers, and building on its trusted reputation for mapping, navigation, and tracking, ViewRanger has become the map and navigation app of choice for many search and rescue teams, especially in Great Britain, Ireland, and increasingly the USA. ViewRanger is available to download for free for Apple iPhone and iPad via the appstore, for Android smartphones and tablets via Google Play, for Nokia Symbian phones via Nokia Store. ViewRanger is free to download and fully functional with global mapping that can be stored offline and thousands of free trail guides available. Additionally highly detailed topographic mapping sourced from national mapping agencies and premium publishers from most European countries, USA, Canada and New Zealand can be purchased in-app.